Here are some pictures of a Beech 40 space saver with stainless steel bars in place of the lower risers and traditional risers to the top section this particular combination was chosen because the top section is going through a bedroom wall and wants to be closed off and with the lower section being open plan it gives a feeling of more space on the landing area. 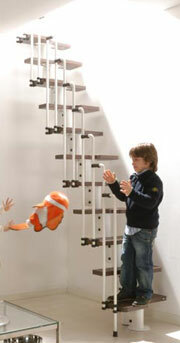 The 40mm tread thickness with the Engineered Beech gives you the required strength for the openplan option. The Stainless steel riser safety bars are required for Building Regulations and the 100mm sphere regulation. You can upgrade the Beech 40 Spacesaver to Openplan this does add extra cost as the manufacturing time is longer. 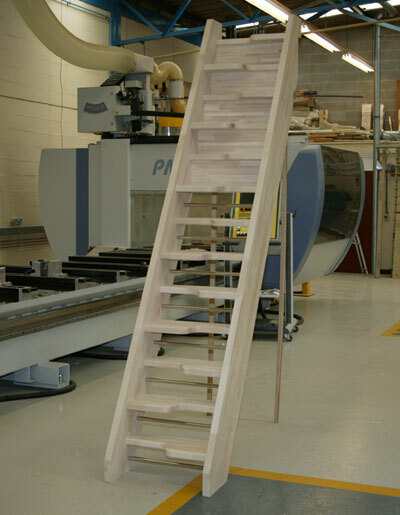 This Beech 40 Openplan spacesaver is in the New Steamed Engineered Beech . 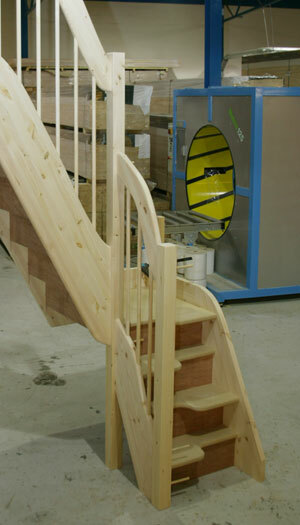 On all openplan staircases the top riser is left closed as this sits aginst your trimmer joist . 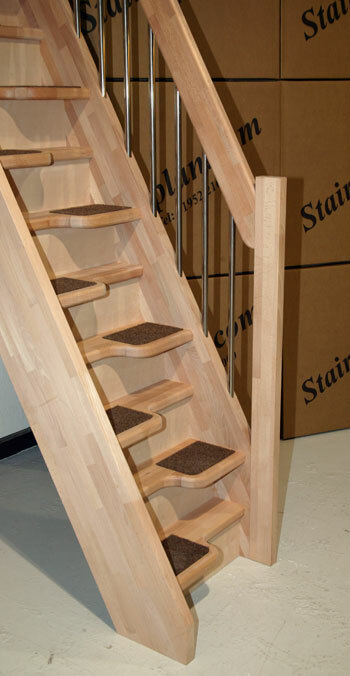 This Staircase also has the new European style handrail we offer on the Beech 40 Model. 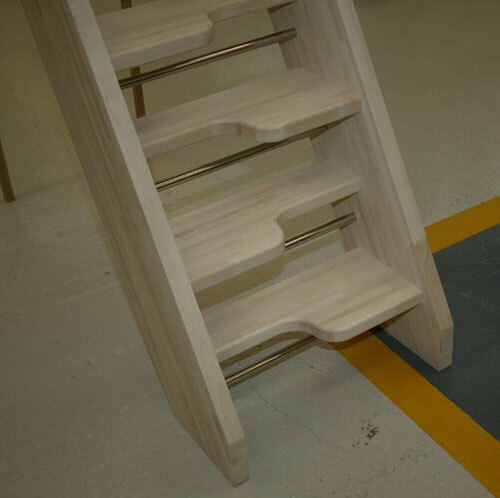 The Balusters are drilled directly into the string and the handrail. The treads on this spacesaver have been recessed for the optional carpet inserts. You can also order the European style handrail for Landing handrails just let us know the lengths you require with your enquiry. 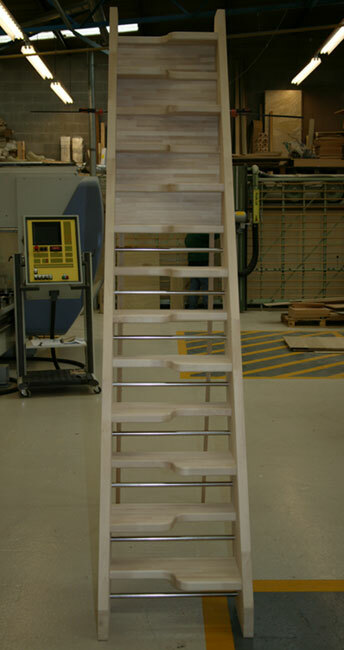 The European style handrail shown here on a standard closed Beech 40 Spacesaver. Shown with the carpet inserts option. We now offer a similar option on the Budget spacesaver and the Birch 24 spacesaver we currently call this the New style handrail, this option is constructed the same way as the European style handrail with the balusters drilled directly into the strings and handrail the main difference is the materials the Balusters are a 20mm Pine Dowel section and the handrail is pine the same as the string. 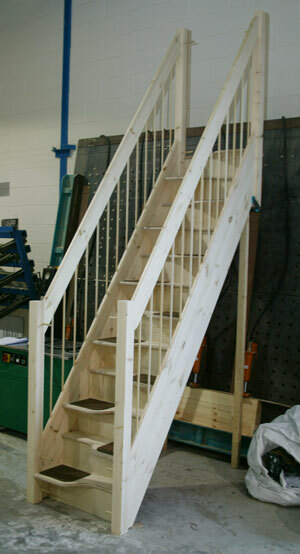 Here is a Budget spacesaver staircase with a quarter landing turn and the New Style handrail option. 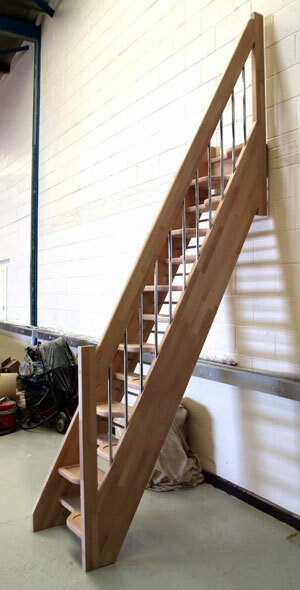 As these spacesaver staircases are all made to measure we have a great deal of flexability with the sizes but if you dont have enough space we dont have a magic wand and there are many people who think we do ! 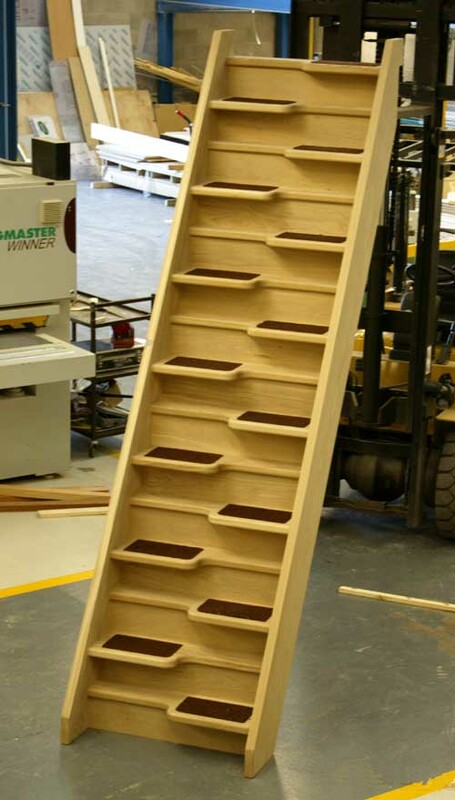 The Quarter turn detail does add quite an expence when constructed all together as this one if your spacesaver staircase is going to be between walls you could choose to cut down the strings on one of our Flatpack spacesavers and form the landing yourself or order the spacesaver in 2 seperate runs for a small additional charge. 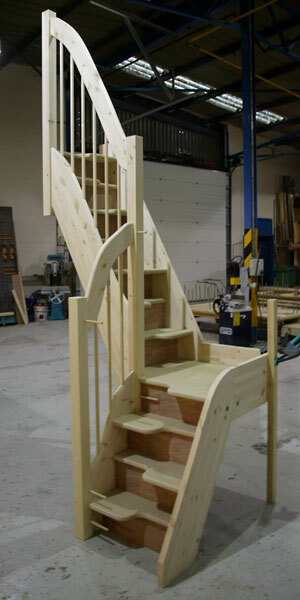 We can also make our space saver staircases shallower and more user friendly if you feel its too steep in standard form. If you are looking for a quarter landing spacesaver or one of the bespoke options above phone us on 01952 608853 or fax us a sketch on 01952 228679. 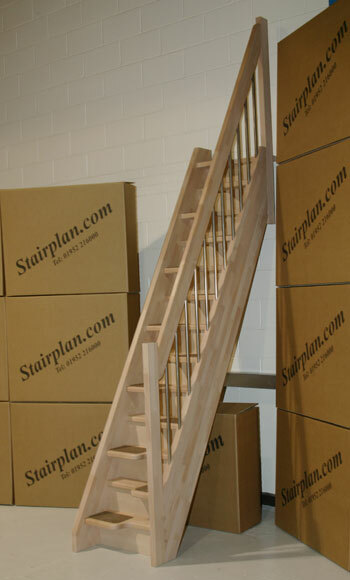 We offer a wide range of spacesaver staircases full details of sizes and prices can be found online.